In almost every industry, startups and venture capital included, content marketing has become an essential tool for growth. Over the past four years, I’ve developed infrastructure, analyses and processes to help this blog grow from just a few visitors per month to nearly a hundred thousand today, achieved a Twitter follower quarterly growth rate of 20% and built a mailing list of close to one thousand readers. In this post, I’ve detailed are the strategies, software and techniques I use. 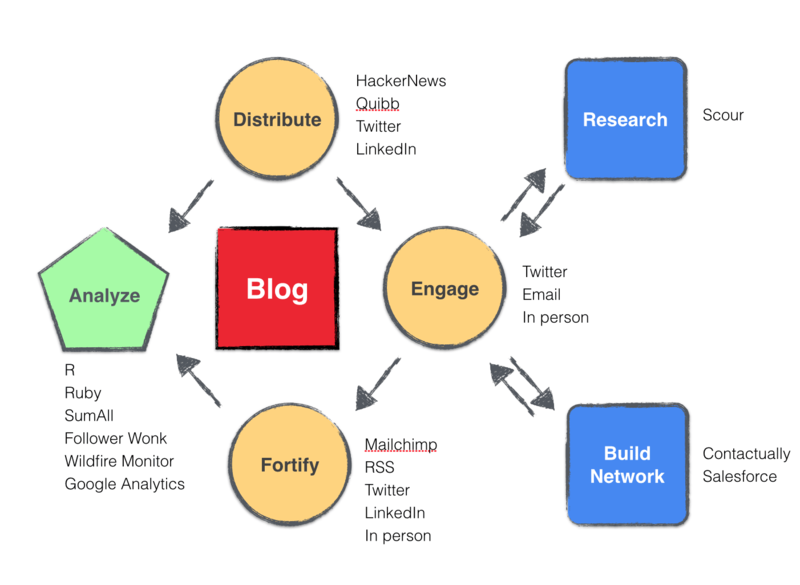 This is the architecture diagram for the blog. Content syndicated as part of the effort must be high quality, genuine and relevant to the target audience. At the outset, I measured the blog’s sucess with metrics like traffic growth and increased follower counts. But I’ve come to believe that to be successful, content marketing must further a business goal like increasing marketing qualified leads, brand building, or recruiting. Therefore, content marketing infrastructure can’t simply be a blogging platform and a Twitter client. The content marketing systems must tie into customer relationship systems (Salesforce), applicant tracking systems (Jobvite), customer support systems (Zendesk) or the like. My goal for the blog is to first contribute to the startup community with content, then reach all the relevant entrepreneurs I can and ultimately build lasting relationships with entrepreneurs. I believe that great entrepreneurs can come from anywhere. This blog helps me find them. This is my process: Every working day, I write a post. First, I syndicate that post to the places entrepreneurs congregate online. Today, those places are HackerNews, Quibb, LinkedIn and Twitter. These social channels and dark social visits generate more than 50% of the traffic to the blog. Direct navigation contributes 30%, and email plus RSS account for the remainder. Second, I try to respond to readers’ comments and suggestions. Inbound volumes vary by day, sometimes it’s just a tweet or two. Other times, I receive fifty tweets and emails. Many of these responses happen offline. The blog’s content breaks the ice during meetings and starts conversations at meetups and conferences. These interactions, both digital and physical, help me build audiences on Twitter, LinkedIn, and Quibb. But building an audience and increasing follower metrics aren’t the end goal. I want to find and meet entrepreneurs among those audiences and build relationships with them. To solve that problem, I built a tool in Rails called Scour. Scour aggregates publicly available data, applies some basic filters and scours each week’s new followers to surface entrepreneurs and other people in the startup ecosystem. Each week, Scour combines those people into a business development list that I use to grow my network. I contact each person on the Scour list to chat or meet. After the meeting, I add a few notes about each person into a CRM for people called Contactually. These details might include a funny story, shared interests, mutual friends, and personal goals. If the person I’ve met is an entrepreneur, I catalog the salient details of their business in Salesforce. Third, I try to deepen and extend my relationship with people in my network and with readers by offering email subscription and RSS subscription on the blog, by creating periodic follow ups in Salesforce and Contactually to schedule meetings, and by nurturing those relationships as best I can. Last, I analyze each step of the process to determine how well the four initiatives are performing. Each day, I consult my SumAll dashboard for site traffic, email deliverablity, email list growth, Twitter follower growth and engagement rates. Each week, I’ll review changes in Twitter audience using FollowerWonk and Wildfire’s Monitor tool to benchmark growth. In addition, I’ve instrumented the blog with custom Google Analytics triggers to track social sharing, subscribes and internal site navigation which are analyzed each week. That data informs changes to the layout and style of the blog. Each weekend, I analyze one key component of the blog’s performance. Last week, I researched the impact of headers and images on engagement and bounce rates. Other areas I explore include site performance, SEO, content keyword analysis, twitter recirculation analysis, social sharing time of day analysis, twitter ads analysis and many others. I code each of these projects in Ruby and R and then add them to a periodic analysis to ensure none of the conclusions change with time. Ultimately, content marketing, like performance marketing and brand building have to contribute to the business in a quantifiable way. By coupling content marketing to a path-of-business system and instrumenting every step of the way, it’s possible to create a performant engine for growth.